You want your child to be able to cope with failure. To raise a resilient child, here are the qualities that you must foster in them. The University of Wisconsin-Madison School of Business found that people with more confidence also tend to be more optimistic and resilient. Students who are confident are more academically successful, and are just happier in general. They also have the ability to overcome failure. Confidence gives children the ability to try new things, take risks, and meet new people — and when those things don’t work out, they can try again. Because they are confident, they believe that they simply need to try a task in a new way, rather than believe that they “can’t” do it. To help your child feel more confident, praise them based on their efforts, not their intelligence. It may also help to, instead of saying that you are proud of them, ask if they are proud of themselves. Competence also goes a long way towards resilience. It’s easy to think of competence as equivalent to mastering school materials, but in reality, there are many ways a child can feel more competent. The key to competence is mastering a skill or developing a certain strength. This can happen in or outside the classroom. You can help your child develop competence by giving them plenty of opportunity. Start by giving them a task that will initially be challenging, like helping with dinner. When they finish chopping vegetables or mixing the sauce, praise their efforts. Gradually give them more and more challenging things to accomplish, and the feeling of achievement they get will help them to go after bigger challenges in the future. A major factor in resilience is a strong sense of connection to the people around us. By having a strong social support network, children feel protected and safe to try new things because they know they can count on people to be there if they fail. You can make your child feel more connected by being there for them when they inevitably face setbacks. Your child might feel discouraged when they aren’t immediately good at something, like playing a new sport. Encourage them to try again, recognize their efforts, and share with them times when you yourself have failed. When you share stories like that, your child feels more connected to you. A strong character is not something that you can teach your child. Research shows that children are actually born with morality — a recent study from Yale University found that three-month-old infants show a preference for stuffed animals that act “kindly” over their “unkind” counterparts. Instead of preaching morality to your child, help them to tune into their natural internal compass. A Montessori preschool helps with this by allowing them to freely explore the world with natural curiosity. Of course, there will be times when a selfish desire may overtake, and they need correction. The best way to deal with this is to teach them standards they should follow, and lead by example. Resilient people believe that what they do makes a difference. This makes sense: if your contribution is worthless, why would you even try? If you know that what you are adding to a group matters, you are much more likely to keep trying even if you fail. Talk to your child about contributing to groups. Ask them about how their contributions make a difference at school and with their friends. Make sure they realize the actions that they take in the household are important as well. For example, if they finish all their chores, talk about how that helps everyone in the family. This will help them find more value in what they bring to the table, and keep them committed to trying. One of the best things you can give your child to help them become resilient is a consistent environment where they can feel safe to take risks. 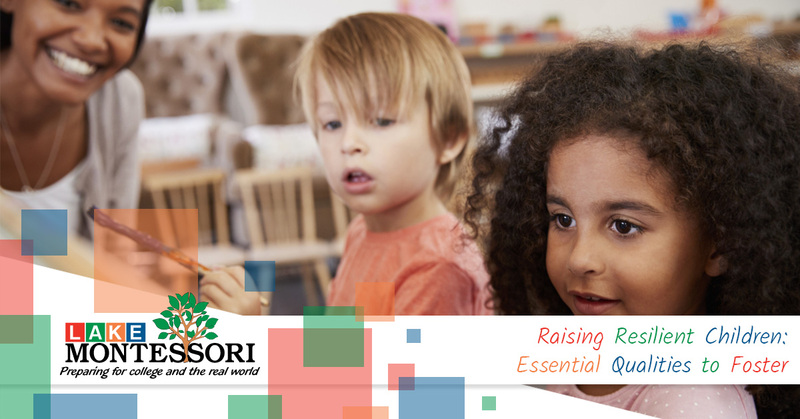 At our Montessori preschool in Leesburg, we are happy to give your child a place where they can use their own curiosity to motivate their learning. Contact us today to schedule an appointment!